 the cottage gals: What's in store? I can't wait to show you the great stuff we found at auction. Linda had the truck filled in the time it took me to find 2 cool old signs. (She makes me so proud.) We have layered the shop with cool new old finds. Some things are already sold. We found a great old two piece red and white stepback with wonderful old hardware, a really unusual old pedestal sink with an iron base, a sweet painted washstand, a wonderful old red painted toolbox with lots of compartments, a French Country cupboard and more. I'll post photos soon. The shop is looking pretty happy! This week has been eventful; Linda's dog tried to poison himself (too much negativity on tv), Amy almost got run over by an 18 wheeler in a fast food lane (proving that fast food really is not good for you) and my poor brother woke up to a violent case of ulcerated varicose veins and had to be wisked off via ambulance to the hospital for stitches (OOOwwww and EEwwww) and it's only Tuesday. What will the rest of this week hold . . .
We're gearing up for the D C BIG FLEA in July. We're leaving town Sunday for another buying trip. I'm looking forward to pictures of the new stuff and I will be sure to look for you at the Big Flea.